Climate change and environmental influence lead for some years to a higher increase of the growth in fire protection markets. The markets for fire protection have gained importance in the last years. The death toll of fire accidents is approx. 12 000 in the USA, 7000 in Europe and more than 50 000 in Asia per year. The loss of assets is about 70 billion Euro per year with an increasing tendency. The total worldmarkets show growth, but very different developments in different segments and countries. The market worldwide shows growth rate of over 10% since 2009 and reached over 80 billion Euro in 2010. There are 500 companies holding more than 40 percent of the world markets and several thousand for the rest. The companies develop “Brands” for products and portfolios to market worldwide with the same standards and qualities. This market is more and more a competition active market. But it’s a new market too, and new technologies and processes will bring new chances for the companies to market their products world wide. FIRE PROTECTION INDUSTRY Growth, Innovation and New Standards. Innovation in FP is the result of external factors, including regulations, changing infrastructure and growing pressures for more sustainable measures. Increasing population, the trend for high rise buildings are a challenge for active and passive FP today and the next decades. We expect the next few years 6 times more high-rise buildings than today worldwide. Improve performance is the Key for the companies to remain profitable and generate growth. Growing in the value chain is better for many companies than in their own segment globally, as well as locally. Global warming increase in the overall temperature lead to catastrophic events and demonstrate the importance of new standards to ensure life safety and property protection. Sustainable technologies is a requirement for manufacturers for example moving away from agents that environmentally damaging. Infrastructure and buildings getting more complex FP has to suit these requirements. Future product development, combining existing technologies and allow manufacturers to drive innovation in the market environmentally friendly and safe for people and valuables. Last but not the least, disruptive technologies and innovations such as nanotechnology and information technology create new methods and new applications for more efficient fire protection and save the loss of life and property. 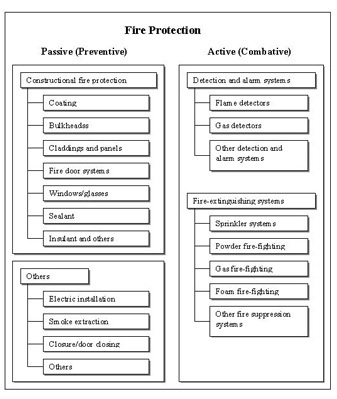 Passive fire protection is basically a fire and smoke resistant construction and is defined in various building codes. However, many countries developed their own standards and regulations and best practice guides. An overview of these regulations, standards and accreditation is necessary for any international competitors. Goal and task of the study is the definition, evaluation and prognosis of the products and services. Further, the competitive situation will be analyzed and market developments up to 2025 will be examined. 1.1 Intumescent coatings for steel, wood, cables etc. This section can be purchased separately, with details in the single sectors, please contact us for inquiries. The study is finished and can be delivered right away. It contains about 500 pages in total. Languages : English/Chinese/German, other languages by request. For the other items, your request is welcome. For further information and offers, please contact us. 7) Exclusive Questions and Tasks Raised by You! If you would like to bring your own questions and tasks into the study, please write us. We will make an offer. If you need or wish a special study, please make an inquiry.